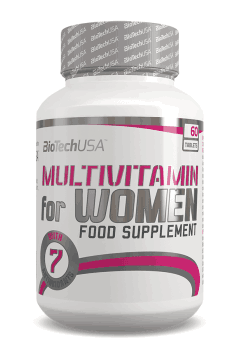 BioTech Multivitamin For Women is an advanced dietary supplement which contains a blend of substances which support the functioning of the female body – as many as 12 vitamins, 11 minerals and other substances which enhance the action of the formula. The product helps make up dietary deficiencies, promotes health and well-being and improves the condition of the skin, hair and nails. It contains a complete blend of vitamins which includes vitamins with antioxidant properties (vitamin A, C and E), vitamin D and B vitamin complex (B1, B2, B3, B5, B6, B12, folic acid and biotin). Antioxidants neutralise excessive free radicals which speed up ageing processes. Such properties are characteristic of, among other things, vitamins. Vitamin E contained in this formula is one of the main antioxidants. It has anti-ageing properties and affects beneficially skin hydration and smoothness. Vitamin C shows a photoprotective effect and that is why it reduces symptoms of photoageing. Vitamin A exerts strong antioxidant activity, is involved in keratinisation and necessary for melanin production. Vitamin D is required for differentiation of keratinocytes and hair growth, has a photoprotective effect and is also critical to normal immune response in the skin. What is more, it is responsible for proper bone mineralisation and efficiency of all systems in the body. B vitamins are responsible for a healthy nervous system. They foster well-being and have a beneficial impact on cognitive functions. Their deficiency may cause a bad mood, neurosis or even depression. Calcium is critical to normal metabolism of bones and teeth and regulates blood pressure. Magnesium is essential to healthy functioning of the nervous system. It helps maintain a normal heartbeat and cardiovascular function. Iron is necessary for red blood cell production. This element must be provided for the body in adequate amounts to compensate for its loss during menstruation. Boron has a chemopreventive effect. Zinc improves healing of inflammation, aids in restoring an optimal pH of the skin and supports beautiful hair and nails. Copper promotes wound healing, improves collagen production and firms and oxygenates the skin. Manganese supports nervous system function. Silicon improves the condition of the skin, hair and nails, helps remove toxins and strengthens bone and joint structure. Chromium has a positive effect on sugar balance and carbohydrate tolerance. Apart from antioxidant activity, selenium has also anti-inflammatory and anti-cancer properties. Iodine encourages the production of thyroid hormones, helps maintain normal water-electrolyte balance and supports a healthy nervous system. Choline takes part in acetylcholine production and supports cognitive functions. Alpha lipoic acid neutralises the excess of free radicals and supports the regeneration of other antioxidants (vitamin A, vitamin C and glutathione). Inositol contributes to improving insulin sensitivity. Green tea leaf extract influences positively the loss of body mass and body fat. Wheat grass is a raw plant abundant in health-promoting substances. It supports erythrocyte production and improves tissue oxygenation. Spirulina helps make up iron and vitamin B12 deficiency and is also a source of protein. Parsely provides valuable vitamins and minerals. Cranberry promotes a healthy genitourinary system. Lutein and lycopene show antioxidant properties and supports eyes in protection against harmful radiation. Citrus bioflavonoids mitigate harmful effects of reactive oxygen species and have anti-cancer and anti-inflammatory properties. To sum up, BioTech Multivitamin For Women is a dietary supplement designed specifically for females which enriches a diet of every active woman. It provides high-quality vitamins, minerals and extra health-promoting substances which will be useful definitely both for active and busy women and those who just want to take care of their general health. Formula intended for regular daily supplementation. One tablet daily is enough for women who follow everyday a healthy, balanced diet. Factors such as increased physical activity, consumption of highly processed food and frequent exposure to stress may lead to hormonal imbalance and vitamin and mineral deficiencies. In such cases, it is recommended to take a higher dose – 2 tablets daily. Bulking agents (microcrystalline cellulose, hydroxypropyl methyl cellulose), anti-caking agents (magnesium stearate, stearic acid), silicon dioxide. Wheatgrass, when harvested at the early stage of growth, provides many valuable nutrients. Owing to them, it has a far-reaching, beneficial impact on the body. It is a source of vitamins (A, C, E and B vitamins), minerals (phosphorous, potassium, sodium, magnesium, selenium, zinc, iron and calcium) and enzymes (PYD1 and SOD). Wheat grass contains also chlorophyll (even up to 70%) whose molecule is similar in structure to haemoglobin and thus encourages the production of erythrocytes, improves tissue oxygenation and influences beneficially overall cardiovascular function. Due to the content of numerous bioactive ingredients, wheatgrass shows multiple effects – it supports digestive function (relieves constipation, nausea and bloating and helps cleanse the body), has a beneficial impact on skin quality (treats burns and improves skin regeneration), boosts antioxidant protection (prevents inflammation and slows down cells’ ageing) and helps lose excess weight. Wheatgrass is recommended both for internal and external use. It is available in the form of juice, powder and capsules.